News from Design Hovie Studios - International Graphic Design: Is blue the new green? Everyone seems to be green these days. Not that it's bad but it does make me a little anxious since Design Hovie Studios' color has been a vibrant spring green since 2004. While it was unique 5 years ago, I fear with each new eco-friendly piece that uses the green, it makes us seem somehow pedestrian. For now I'm determined to ride out the green wave in the hope that new colors will come along that also symbolize a friendliness to the environment. 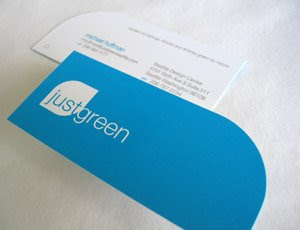 We've even done our part in the brand for Just Green giving them a sky blue corporate color that is clean and friendly and different.